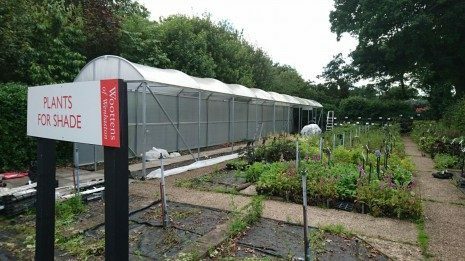 Woottens of Wenhaston – The Relocation! In July of 2016 the nursery had to be relocated from it’s site on Blackheath Road to the land containing the nurseries Iris fields. Soon to be called ‘The Iris Field’ and become the new permanent address. 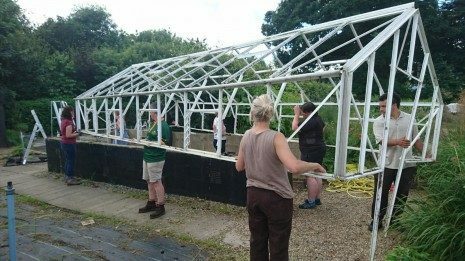 This monumental task was carried out by two determined new owners, five wonderful staff members and a team of volunteers consisting of family, friends and the odd rugby team! For more details about why the nursery had to move visit our ‘About Us’ page, or read on below to find out exactly what the week entailed and how it was done. We apologise in advance for the poor grammar and miss-spelling – each blog was written late in the evening after each day passed and we became more exhausted! The official day one of the move began today in glorious British sunshine. As a predominantly ‘office based’ staff member I have to admit that I have discovered aching muscles this evening I forgot I had! But I feel very proud of our achievements, after a hearty nursery breakfast we began moving our hardy Geranium collection to the new site. They all received their Chelsea chop before the move, to encourage fresh young growth and prevent to much ‘distress’ through these sunny and windy days. Although it is always a shame to cut off the flowers it will benefit the plant hugely and they will usually spring back and give you a second flourish of flowers this season. We did the same to our Brunnera plants that were a little drier than they like, a good drink and removal of larger leaves will give them a well deserved rest as we tucked them under some shady quince trees on the new site. Aquilegia flower stems, seedheads and old foliage need cutting back too, although you’ll be left with a bare crown you will encourage lovely fresh summer foliage within two weeks, just have some patience. However our biggest task today was taking down the old Clivia tunnel. When we knew about our pending relocation we decided to rehome the Clivia collection with an Agapanthus specialist in Sheffield. They are there now receiving all the care and attention they require that sadly as a hardy perennial nursery we struggled to give them. 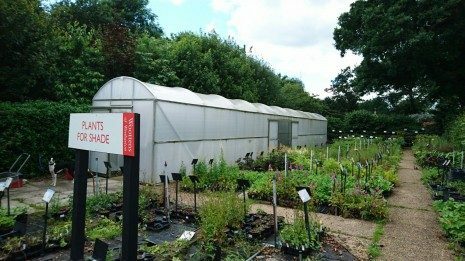 On the new site the tunnel we become or home of propagation, growing plants for seeds and cuttings including: Salvia, Penstemon, Nepeta and much more. The tunnel was near completion by 5pm when the heavens opened, so work was halted until tomorrow. Hopefully the Victorian Auricula house will also come down ready for relocating for next years Auricula weekend. Here is how the ‘shade end’ looks now! Tunnel up to tunnel down with just 3 staff and 2 wonderful volunteers, not bad! Our Auricula collection finished flowering about 3 weeks ago, the last to flower are usually the alpines and double varieties. Luckily for us they were ready to be rested in the cool for the summer months before we begin dividing them in the autumn. 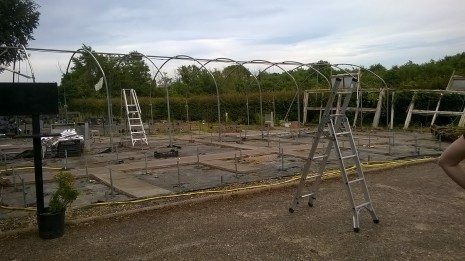 We began the slow task today of move the Auricula alpine greenhouse. A task that requires care, precision and a very methodical team in order not to break or crack a single pane of glass. I’m proud to say that every pane is still in one piece! Once empty it’s surprised us how large this alpine house actually is – housing 800 little auricula plants for the past 15 years. 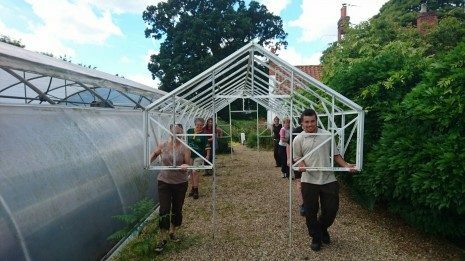 Once the glass was removed – 9 staff members and helpers carried the frame from the nursery location to the new site along the main road much to the surprise of oncoming traffic! Well, when a job needs doing……………………..
Well, three days in we’re still all in high spirits and thankful for the dry weather. 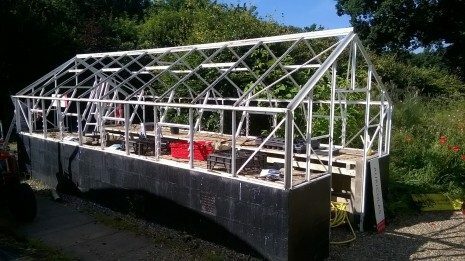 As well as tunnels, greenhouses and plants we have all the vital benches to move. 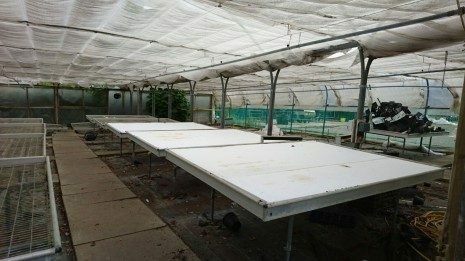 Some are wooden benches, others metal rolling benches for space saving and some hot benches for striking cuttings. Our main task today was to relocate our Pelargonium collection and the benches that support it. Now all these benches are concreted in so as well as taking them apart and rebuilding them we decided to also take the concrete posts! Why not?! Great work to Matthew for digging these out. So currently all our Pelargoniums are being housed outside in the sunshine and easterly breeze until their benches are rebuilt. Surprisingly Pelargoniums need the summer months outside where possible. It is a misconception that these south African native plants should be indoor plants in this country, they can get stressed too humid and suffer badly from greenhouse aphids if kept permanently indoors. A period of time outside will do them the world of good. As the days roll on I have to admit the tiredness is kicking in. Muscles are beginning to ache and the days seem hot and short. However we have achieved many tasks over the past two days, all the plants are now relocated and its wonderful to see them altogether and thriving in the sunshine. We have sheltered the shade loving plants such as Actaea, Rheums and Hostas underneath quince trees at the field, these particular plants will crisp and perish in scorching sun and wind. However our Agapanthus and Hemerocallis are dancing in the full sunshine, all in bud or flower. The queens of summer! 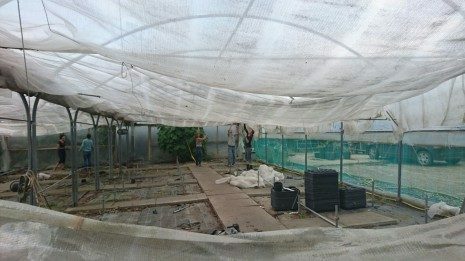 The toughest job so far this week has been the dismantling of the Pelargonium stock tunnel. Erected over 15years ago it is well and truly fused into position. However finally today we have managed to remove 4 of the 8 metal hoops as well as the plastic and supporting struts. This tunnel also housed 3 of our hot benches, easily constructed using wooden sides, polystyrene base covered in plastic and filled with sand. Through the sand and gravel runs electric heated wires giving a base temperature of up to 30 degrees. Therefore we needed to shovel 2tonnes of sand and gravel off the benches in order to move them. All worthwhile to be able to continue propagation on the new site. 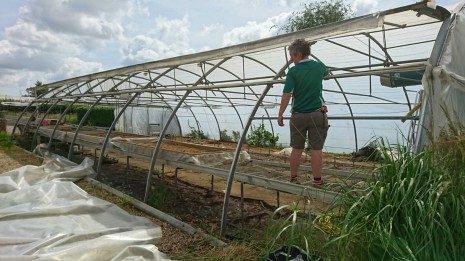 Looking forward to beginning the next polytunnel tomorrow……. 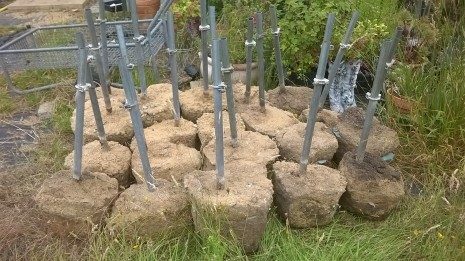 Finally after three days the Pelargonium Stock tunnel is down – we all watched in relief as the last hoop fell, it reminded me of Fred Dibnah and his toppling chimney stacks! After moving all the hot benches and hoops we sat down at 6pm last night to enjoy a drink. 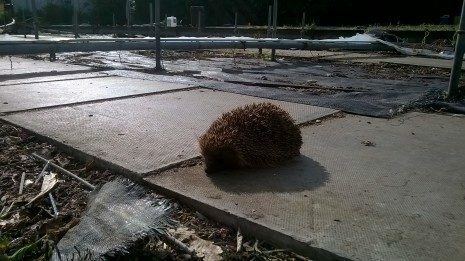 Unbeknown to us from underneath a pile of mipex and dust appeared a hedgehog – wobbling it’s way along the pathway that was a polytunnel. After some delicate investigation we realised it was a family of hedgehogs that had been nesting underneath a hot bench this summer. Luckily during the dismantling the mother and three babies hadn’t been disturbed or harmed. After a phone call to a Hedgehog Rescue centre we’ve decided to leave them in their home until they decide to leave. The babies all have their needles so hopefully they’ll venture out soon into the nearby woodland. 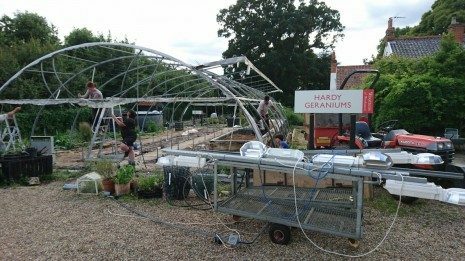 Tomorrow we tackle the Pelargonium Sales tunnel – a huge double span tunnel – with just three steps ladders and a collection of 13mm spanners! 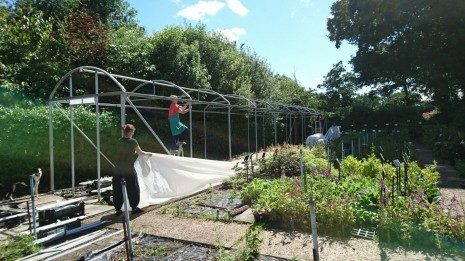 In just one day we managed to dismantle the double span Pelargonium sales tunnel – with members of the help of Southwold Ladies Rugby Team! Pictured below enjoying a rather different kind of victory. The most fiddly of all of the tunnels this one involved 24 benches, 6 hot benches, miles of fleece and wiring for winter protection and a pair of stubborn wooden front doors. Not to mention the 20 hoops towering at 15 feet tall above us. 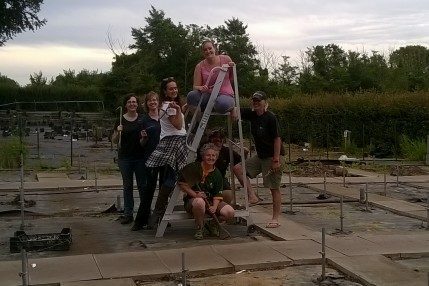 Although staff morale was wavering on day 10 – the Southwold Team were energetic and enthusiastic about the task – a huge thanks them! Now the final tunnel is down the nursery site looks a little sad and empty – but the new location is bursting with colour, pictures will follow shortly. 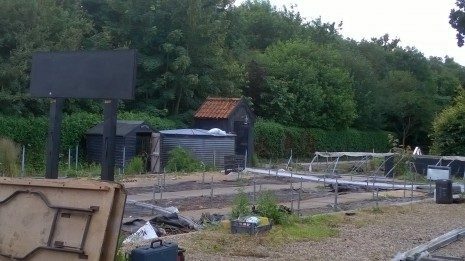 Although its going to take us some weeks to remove all the debris, bench legs and irrigation from the site we can now at last see a little at the end of the polytunnel! Business is up and running once more!